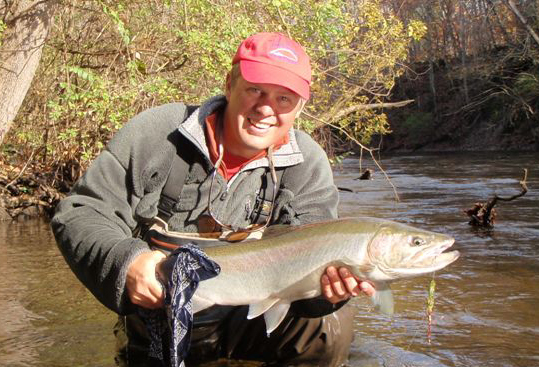 Join us in welcoming Michigan Guide and owner of Ripple Guide Service Dustan Harley, as he walks us through a years worth of fly fishing on the St. Joe River. Learn about this fish factory and when the best times to pursue steelhead, salmon, smallmouth and other exciting species so close to Chicago. A Year on the St. Joe -SAT FEB 25th - 4-5 PM at the shop - Seating is limited and show starts at 4 pm sharp! It has been said for the fly-fisherman, the St. Joe River is an enigma wrapped in a mystery. This program will unwrap the mystery of what is quite possibly the best steelhead fishery in the United States. This presentation covers the vast angling opportunities the river and its tributaries offer throughout the year. Included are techniques for steelhead, salmon, smallmouth bass, rod/reel selection, fly selection, terminal rigging, and reading the water.